How do you make pom poms? It`s quite easy really, and you can make one in less than an hour if you`re good at winding. For little hands it can be hard to master the skill of sewing so making a few pom poms will help get that in and out motion perfect. Are you ready! You will need some wool. Maybe 2 colors will make it interesting and you will need 2 cardboard rings the same size. Ask an adult to cut them out for you if you are not used to using scissors. Don`t make the hole too big. The hole should be no bigger that the width of the ring. See the picture for reference. I have shown some squares of felt of different colors so that if you like you can cut and paste googly eyes and ears to make funny animals out of your pom poms. Take quite a long length of wool and tie one end around the cardboard rings which should be flat together. Now start to wind the wool around and around the rings pushing the wool through the hole, out and over. You have to cut another long piece of wool when the first piece is wound on. When you get good at it, you can cut several strands and wind them on together. That way you will make your pom pom super fast. You could use more than 2 colors of wool if you like. Have a look in your sewing crafts box for ends of woolen balls. But if you want to make pom poms into woolly animals you will need to think of the right colors to use. For a cow, you could use black and white, or pink for a pig. Keep winding the different colors of wool around the rings. The hole in the middle will eventually become too small making it difficult to wind more on. Now it`s time to cut and tie your pom pom. You`re going to cut through all the layers of wool around the circumference of the ring. This word means around the outside edge of the ring. It can be a bit difficult and sharp scissors are needed for this. If you feel confident to do it yourself, don`t mind if an adult wants to supervise. Sharp scissors can give nasty injuries. When you have cut right to the cardboard rings all the way round, pry the rings apart slightly. The next step is to get a long piece of wool and wind around your strands of wool in between the two rings. Wind it a couple of times tightly then tie it in a knot. I prefer using string so I can tie it tight because wool can break too easily. The loose ends of the string can be cut short so they don`t show. Then you can wind and tie the length of wool to hang it up. Once that`s done, cut off the cardboard rings. Your pom pom can look a big shaggy at this stage so give it a trim, but not too much. Ok, your pom pom is finished. Kooool! 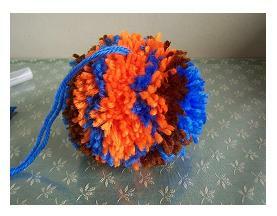 Now you know how to make a pom pom, watch this space for the "ra! ra! " and some other ideas, kool kids crafts style! Need an extra hand? This pom pom tool helps kids to make their pom poms a lot easier, but it need not substitute the old fashioned way using cardboard rings. Try practicing with card and then go on to use the tool if you plan on making lots.